Bollywood Superstar Salman Khan will be visiting Himachal Pradesh. The actor will be attending his sister Arpita Khan’s marriage reception there. The state government of Himachal Pradesh has declared the Dabangg Khan as a state guest. Salman Khan will be provided a chopper that will take him and his family from Chandigarh to the venue. Salman Khan and Family are leaving for Mandi today, the hometown of Aayush Sharma his sister Arpita Khan’s husband. A traditional community feast Dham has been arranged by the state Rural Development Minister Anil Sharma to felicitate his daughter-in-law and son. 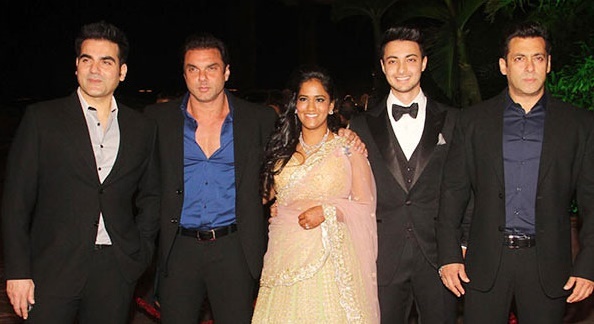 Arpita married Aayush, the grandson of former telecom minister Sukhram, on November 18 last year. Salman Khan is currently out on bail after being convicted in a 2002 hit-and-run accident case. The High Court had suspended his sentence of five years and granted the actor bail. A man was killed and four others were wounded when Mr Khan’s Toyota Land Cruiser ran over them while they were asleep on a pavement outside a bakery in suburban Bandra on September 28, 2002.